2 værelses 1. sal Apt, sovepladser op til 4, Fælles pool i rolige omgivelser. AIR CONDITIONED, første sal lejlighed, til rådighed for udlejning, en 5 minutters gang fra Dalyan centrum og 3 minutter til nærmeste supermarked. MARBLE TILBEHØR HELT med en marmor pejs og brusebad. Stor (24 5 kvm) køkken / stue med høj køle-fryseskab, vaskemaskine, opvaskemaskine, mikrobølgeovn, gaskomfur, elovn og alle de køkkenredskaber du har brug for. Et soveværelse med dobbeltseng og andet soveværelse med to køjer. Badeværelse med bruser, toilet / bidet og håndvask. 3 overdækkede terrasser, hvor du har sol / skygge hele dagen rundt. Frontterrasse giver udsigt over de smukke bjergrige haver og swimmingpoolen. Bagfra uhindret udsigt til bjergene og solnedgang om aftenen. EN STORT, TRANQUIL beliggenhed - Perfekt til afslapning og afvikling alene eller med en lille familie. 50 kvm fælles swimmingpool (rengøres to gange dagligt). Udendørs bruser ved swimmingpoolen. Samlet etageareal af denne lejlighed er en rummelig 55 kvm. Denne lejlighed er bygget til de højeste standarder (i 2007) og er perfekt beliggende meget tæt på den smukke feriested Dalyan. We stayed here in August as a family of 4 and this apartment was perfect for our needs. It is situated in a quite area but within a short walking distance of the town, river, a great local Haman and the local market. The neighbours are very friendly( we even got invited to their wedding celebrations!) There are great mountain views from all three balconies and it is possible to sit out in sun or shade at any time of the day. The pool was lovely and warm and deep enough for a decent swim, and we more often than not had it all to ourselves! The apartment was well equipped, we got particularly good use out of the air con and wifi! Communications with the owner were excellent and I would thoroughly recommend a stay here. Many thanks for your kind words Sarah and glad you and your family had a fantastic time. We have been many times to Dalyan,We will be back.Just love the place. Many thanks for you kind words Hazel and for being great guests. Look forward to welcoming you back at the apartment in the future. Superb - just what we wanted! This was our 6th year running to Dalyan in a similar accommodation. The apartment was just what we wanted - a great base after a day out exploring and chilling on the beach. Dalyan is a lovely holiday resort, not party central but a place of nature and history. Lovely shops and friendly people. The beach is lovely and worth the 40 minute boat ride - Kingfisher and bird of prey spotting (or 20 minute dolmus trip to the turtle hospital end). The early morning water is like an infinity pool. Please don't encourage the local boatmen to coax/tease the turtles with crabs for our entertainment - these beautiful turtles are in danger of getting hurt by boats and they expect this food so they won't hunt naturally as they should. (The boat guys charge extra for this too!) The beach needs to be respected at certain times of the year as this is a breeding ground for the turtles and their eggs are buried under the sand under markers. We thoroughly recommend a visit to Charlie’s Place (Vitamin Bar). Charlie and his wife Natalia are fabulous people and cannot do enough for you. The smoothies are amazing and a great boost at the end of a hard day’s sunbathing! Charlie taught me my love of jewellery making a good few years ago now! He sells his hand-made jewellery at very reasonable prices too. So, a successful holiday all round - again. Only one observation/tip - for a late night arrival, a bottle of water would be a great touch. We are hardened self-caterers as we love to spend all day out and about so it was perfect for us. However, the Iskender Kebab at Cagri (opposite the dolmus terminus) is the best ever! This was my fourth time in Dalyan and third time returning to this apartment. Ideally situated near supermarkets, river front, water taxis, shops etc which is very handy when you have young children (5&7) who don't like to walk! Swimming pool and gardens beautifully maintained. No shallow end in the pool which was perfect for teaching both my children to swim independently. Apartment it's self is very cleans and suited our needs. We shall return again for another great holiday. We had a lovely holiday in this apartment. Very clean on arrival, Lovely pool and gardens. The apartment has three balconies, The middle one is a great place to watch the sun going down on Dalyan with a glass of wine and a nice place to sit for a while after an evening out. We would definitely return. This was my second time staying in this apartment and third time in Dalyan, Another great holiday and I shall be returning again. Myself and 2 young children stayed for a week. Great apartment and location. 3 supermarkets very near by and just a short walk into town. 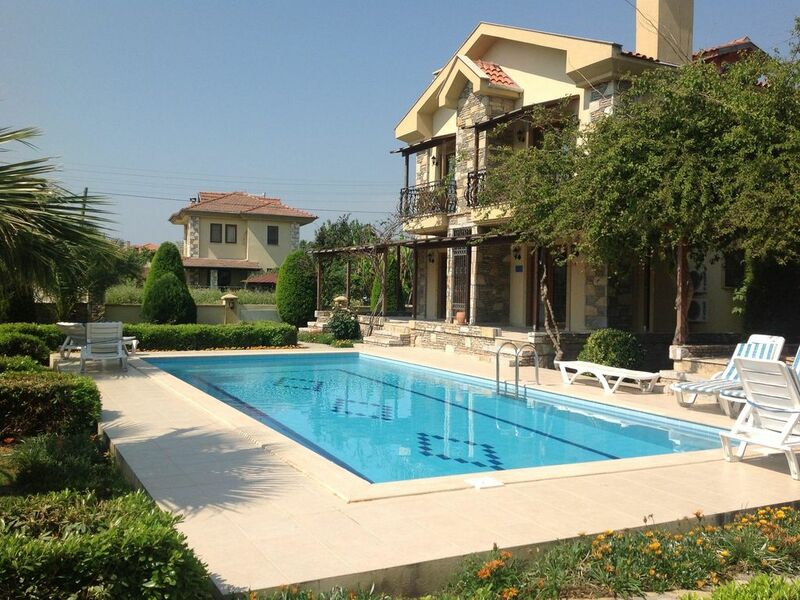 The pool and gardens are very well maintained - kids loved it and preferred it to the beach. You will not be disappointed. Denne lejlighed er beliggende i et roligt område, kun 5 minutters gang fra centrum af Dalyan, 3 minutter fra butikkerne. Du behøver ikke en taxa til at gå nogen steder i Dalyan. Dalyan har et bredt udvalg af restauranter, både i centrum af byen og langs floden serverer fine tyrkiske og internationale retter. Den smukke beskyttet Turtle Beach, adgang til ved en 30 minutters flodbåd krydstogt, som giver en fantastisk udsigt på vej til stranden. En hele dagen lørdag marked i Dalyan 300 meter fra lejligheden. Talrige meget overkommelige restauranter og bars- betydeligt billigere end Storbritannien eller Europa. En Jeep Safari gennem bjergene. Mudder bade og Hot Springs i Koycegiz søen. White-water rafting på Dalaman floden. En tur til en tyrkisk bad er ikke at gå glip af! Byen har supermarkeder, posthus, bank og de fleste andre tjenester, du får brug for på din ferie. Summer 17 deals between June and Aug. Stays over 10 days attract £25 discount.